With Piano Accompaniment. Composed by Various. Edited by Daniel Dorff and Jack Wellbaum. Arranged by Martha Rearick. Orchestral Excerpts. Romantic. Solo part with piano reduction. With Standard notation. Composed 1997. 166 pages. Theodore Presser Company #414-41180. Published by Theodore Presser Company (PR.414411800). Following the success of ?Orchestral Excerpts for Flute,? 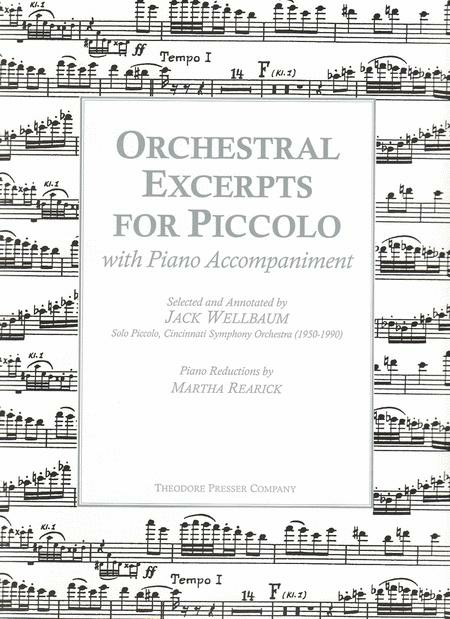 Theodore Presser Company presents ?Orchestral Excerpts for Piccolo.? 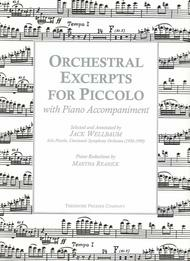 36 of the most common orchestral piccolo audition excerpts are represented with solo part, piano reduction, and practice and performance commentary from Jack Wellbaum, longtime piccoloist of the Cincinnati Symphony Orchestra and teacher at the University of Cincinnati College-Conservatory of Music.